In order to achieve the best possible tenants at the best price it is simply not enough to assume that a beautiful property will find ideal tenants on its own. The potential tenant, while searching for properties, will be exposed to an enormous number of advertisements. It is therefore essential for a marketing strategy to be formed that maximises the chance of that 'good quality tenant' viewing your property. Assuming the property is properly prepared and ready to be let, pricing levels should be researched carefully before the various methods of advertising are considered. 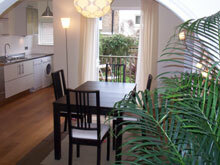 To maximise this advertising the property must be photographed properly and plans drawn for premium properties. For more details regarding these marketing issues please explore this section using the various links.